Faced with the near doubling of homelessness in London since 2010, with a Tory government doing all it can to enrich private landlords and property developers, even if it means turfing families out onto the streets, how does a Labour council respond? By boycotting the inhumane benefit cuts? By facing down greedy landlords? By offering more support for rough sleepers? Well Hackney Council has found a far more efficient solution to the problem of homelessness and poverty: ban it! Yes, unbelievable as it may sound, that is the logic of the new “Public Space Protection Orders” (PSPO) introduced in the fashionable parts of Hackney under a new law that gives authoritarian powers to councils to purge their patch of the homeless, the young, travellers, and anyone else they deem an inconvenience. The PSPO means that rough sleeping, street drinking and begging are now deemed “anti-social activities” in London Fields, Broadway Market, Mare Street, Hackney Downs and Regents Canal. The Police, council officers and even private security guards employed by the council, will now have the power to issue on-the-spot £100 fines - with potentially £1000 court fines - to those violating the orders. The measure is part of a wider drive to socially cleanse the capital on behalf of those who can afford its increasingly exorbitant property prices, which has seen the proliferation of guarded ‘communities’ and shopping spaces, a burgeoning private security industry and sadistic innovations in “defensive architecture” with nasty metal spikes to deter rough sleepers. Leaving aside the minor difficulty of how the destitute can be expected to cough up that kind of cash, these new powers are deeply cruel and illiberal. 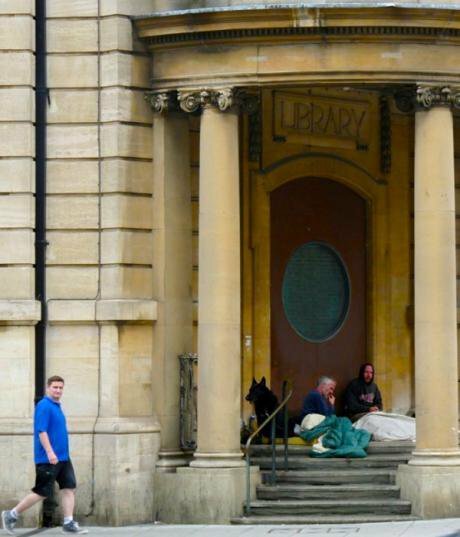 The Council claims that fines will be reserved only for those who persistently “refuse” the offer of shelter, but there are often good personal reasons why people turn down hostel accommodation to do with fear, drugs or mental health. This ban will only exacerbate the exclusion of rough sleepers and make it more difficult for them to seek help from the authorities, as Crisis and other charities have pointed out. Hackney is at the vanguard of gentrification with among the highest rise in property prices of anywhere in the UK. The situation is aggravated for the borough’s historic communities and low income groups by the national shortfall in social housing combined with benefits cuts so brutal they’ve drawn fire from the United Nations for disregarding human rights. Now, to maintain the aesthetic experience of the well-heeled who can afford £4 for a kale smoothie from the local pop-up, the homeless are to be denied the basic ability to survive in public space. Under the rubric of public “safety”, the lived reality of the city, with its poverty and inequality, is being swept under the carpet to be replaced by a sanitised landscaped version of urban life. The justification for the PSPO from Hackney Town Hall is that it safeguards the public and local businesses. The deputy mayor Sophie Linden has talked of incidents of fighting, abuse and spitting at passers-by. But there are already powers to deal with this. So why the need for new prohibitions? Are all rough sleepers now presumed guilty? Perhaps we should also fine sleeping in beds since bed-sleepers too have been known to cause trouble! The PSPO confuses behaviour that is genuinely harmful and distressing with the mere fact of being homeless. It therefore stigmatises a whole class of people as a public nuisance and makes them vulnerable to criminal sanction regardless of whether they have done anything wrong. Instead of “protecting” our public spaces, it corrupts them, broadcasting the idea that only those with money to spend in boutique shops, bars and fancy markets are welcome and encouraging a stark form of social polarisation that smears the destitute as would-be criminals. In reality, the homeless are far more likely to be victims of abuse and violence than ordinary members of the public. Without a secure property of their own, they are in a constant state of vulnerability and exposure. In modern capitalist societies, the homeless are denied a basic right to “be”, which underpins all other freedoms, as the philosopher Jeremy Waldron pointed out in response to a wave of similar regulations in the US in the 1980’s. Everyday activities, essential to human dignity and functioning, like washing and urinating, become a struggle. Systematically denied access to private spaces, the homeless are subject to the whims of restaurant owners and other property owners, putting them in a child-like state of dependence and lack of freedom. To ban any activity like drinking in public space represents a total ban for the homeless who lack a private property of their own to do it in. These sweeping new powers have been created by the Anti-social Behaviour, Crime and Policing Act, which crept onto the statute book late last year. The Act gives local authorities - and potentially just a single councillor - broad powers to regulate or ban any activity in a public space it thinks has a “‘detrimental effect on the quality of life of those in the locality” without the need for any actual proof that the ban is needed. Whereas earlier powers required public consultation and had judicial oversight, the PSPO’s do not. As well as targeting the homeless, in future they could be used to prohibit music, skateboarding, barbecues or any other number of activities deemed annoying or unsightly. This can be done at the whim of a single council officer and then enforced by fines issued by a private security guard on commission from the council with no realistic possibility of appeal. We can be sure that the rights of corporations will trump all others. Enjoying a drink with friends in the park, rather than in a chain pub? Watch out for G4S! At its heart, this is a struggle over who gets to inhabit, shape and define the city. Although councils are supposed to have regard for free expression, PSPO’s could also be used to crackdown on political protest. Struggles over public space have always been intimately tied to who gets to speak and be heard on public matters; to who counts as a citizen. While it used to be the case that only property-owners could vote, in the neoliberal city only the wealthy can express themselves in shared spaces while the poor are shunted to the margins. It is in public squares, parks and streets that new movements are born, like the indignados in Spain whose public square encampments transformed into an organised mass movement that recently took the local elections by storm. The same Tory government that gave us PSPO’s also passed laws to restrict camps and protests around parliament and made squatting illegal in residential properties. The visibility of the homeless at least serves to remind us of their existence and force us to interrogate whether we are prepared to tolerate a society marred by such inequalities. If more local authorities adopt PSPO’s - as many no doubt plan to - then many people who lack secure, basic shelter will have nowhere to go, completing our return to a pre-Victorian regime of social discipline where the lower orders were kept permanently mobile, shunted from town to town by a punitive system of anti-vagrancy laws. Had Hackney Council bothered to consult the public - and not just the police and businesses – they might have found that, despite decades of neoliberal propaganda telling us to delight in the punishment of the poor, Hackney residents aren’t as devoid of humanity as some of our politicians. Update: Hackney Council has backed down and amended the PSPO to remove rough sleeping. However, begging, street drinking and plenty of other victimless activities are still included, giving officers wide arbitrary powers to coerce the homeless and anyone else they deem a nuisance in public spaces. A protest planned outside the Town Hall for June 22nd is still going ahead.